Boot Camp is software with "multi-boot" capability. It is part of the Apple OS X operating system and lets you run Windows programs on Macs that have Intel architecture. You have to partition your hard drive to make it work. However, the task is relatively painless using the Boot Camp Assistant which will guide you through the whole procedure. You will install Windows device drivers and the Windows Control Panel in the process. 16 GB of open HD space for 32-bit Windows or 20 GB for 64-bit Windows. You can boot up in either Apple or Windows mode. Boot Camp is a great way to run FSX because it boots straight into Windows. Essentially, you are running a Windows machine when in this mode. The main consideration is having enough power and memory. Running FSX on full settings on Windows takes a lot of power as it is. Now you are adding Boot Camp in the mix. That means you really should have a beefy Mac with plenty of RAM. There are some other things to consider when using Boot Camp. Make sure you have an effective antivirus program. Also, you need a lot of extra room on the hard drive for aircraft and other add-ons. It will fill up faster than you think. It comes free with OS X 10.6 or above. Good performance running Windows programs. You need to boot the system into your operating system of choice. You cannot switch "on the fly." There is no simple way to share files across the different operating systems. Parallels Desktop for Mac is a proven solution for running Windows programs on a Mac. In fact, well-known tech writer Walt Mossberg recently wrote in the Walt Street Journal, "Parallels 8 does a fine job of running Windows on a Mac, especially Windows 8. It doesn't emulate every feature, like those taking advantage of a touch screen—which the Mac lacks. But it makes Windows 8 work on a Mac pretty much like it works on a standard Windows PC that you'd upgrade to Windows 8." Parallels can run Windows and Mac programs in tandem because it builds a "virtual machine," essentially a Windows machine inside a Mac. This is different from Boot Camp's approach. Boot Camp hands the Mac system completely over to Windows. You can only run one operating system at a time, and must reboot to access them. Some users report that Parallels does not run FSX as well as Boot Camp. User "K1PC" wrote on the Parallels forum (forum.parallels.com) that, "FSX is the really the only thing I use in Parallels, I don't have to do any further upgrades. (But) I get much better performance when I boot into Windows (in Boot Camp) ... and, I have better use of my monitors." Overall, I was amazed at the performance I saw. Parallels can provide up to 1GB of video RAM, which means that even some newer games with large texture sizes will run reasonably well; I was able to play the demo of Hard Reset, an intensive first person shooter, at decent (though not great) frame rates. Older games, such as Microsoft’s Flight Simulator X and Crysis, ran very nicely, with smooth graphics and audio. Even the demo of Call of Duty 4, which ran but with jerky-slow frame rates when I last tested it with Parallels 5, is now playable. While testing the games, I was also able to test Parallels’ support for USB peripherals, which turns out to be quite good. I used a Bluetooth mouse, a Saitek flight stick, a generic gamepad, and a Logitech Momo force feedback wheel and pedal set, all of which worked fine. The only exception was that the force feedback in the wheel isn’t active within the virtual machine. When you connect a USB device, Parallels provides a nice visual dialog box for selecting how it should be assigned, and whether that assignment is permanent or temporary. Window – Run Windows in a completely separate window. Coherence – Operate Windows and Mac side-by-side like they were blended together. Full Screen – Forgo the Mac interface for the familiarity of a Windows desktop. Modality – Use transparent windows to see all the action at once. Parallels allows you to drag and drop files in between Mac and Windows smoothly. You can launch Windows programs from the Mac dock. Most Macs will run windows including iMac, MacBook Pro and MacBook Air. You can download Parallels from their website. To run the program you have to enter a key. After that you can run any Windows program. You can grab Parallels directly from the Parallels website here. VMWare's Fusion takes a similar approach as Parallels. You do not need to reboot to change operating systems. You can launch Windows programs like FSX just as you would a Mac application, using Mac shortcuts and gestures as well. A great feature is the ability to run Windows programs on one screen, or across two or more screens. In "Unity view," you can run FSX without seeing Windows at all. What if you've already installed Boot Camp and want to give Fusion a try? Fusion will run FSX and your Mac stuff straight from your current Boot Camp partition. Early in 2012, Fusion 4 was selected over Parallels by Macworld as the best way to run Windows programs on a Mac. It beat Parallels in 9 out of 11 performance benchmarks. Macworld also found Fusion easier to install and operate. In my reviews of the last couple of editions of Parallels and Fusion, I've found Parallels, which claims about 70% of the Windows-on-Mac market, superior. I'm sticking with that conclusion. I found Parallels faster at every common task, like starting and restarting Windows, and resuming Windows from a suspended state. Not everyone agrees. Over at the a2simulations forum (a2simulations.com) user "Tigerclaw" lamented, "I use VMware Fusion for a "Virtual PC" and run this machine as a Mac and a PC at the same time, but you can't run FSX that way, it's too demanding." You can grab your copy of VMWare Fusion over at their website here. Another option for technically oriented users is Virtualbox, part of Oracle's group of virtualization programs. It was originally developed by innotek as an x86 program. Sun Microsystems bought innotek in 2008, and Oracle bought Sun in 2009. Virtualbox was made not just for Macs. It can run on multiple operation systems including Windows Linux and OS/2. For Mac OS X it allows unlimited virtualization sessions. Unfortunately, Virtualbox so far does not stack up as well as Parallels and Fusion. A Macworld review found that, "In 3D Windows performance, VirtualBox also lags its competition. While there is some basic DirectX support, there’s only minimal support for the Aero interface in Windows. I wasn’t able to get any of my three test games (Half Life 2, Call of Duty 4, Flight Sim X) to run. You may have more success with older games, but anything relatively new will probably not work in VirtualBox." Still, Virtualbox is free software. It is available as Open Source Software working under the guidelines and terms of the GNU General Public License (GPL) version 2. Unlike some open source projects, it is not a stagnant effort. It is actively being developed. There have been a number of releases, expanded features, and new platforms added. It has the double benefit of open source innovation, and the backing of a huge software company. If you have the tech chops and like working with open source software, give it a whirl and see how it works for you. Just be realistic in your expectations. A small cadre of FSX fanatics have come up with some tweaks to make FSX perform faster and cleaner, even on medium power Macs. Now, changing these settings is not really recommended unless you really know what you are doing, and we can't be responsible if something goes haywire. You could even harm your computer so any changes you make are at your own risk. With that caveat, the tweaks and tips can be found on our page here. Steve White wrote some suggestions at the Flight Sim Network to help the "tweaking" process. He said to use the same aircraft when making tweaks because it is much easier to judge performance changes. Also, use an aircraft that ships with the program. Some add-on aircraft can be a little wonky, and will affect the performance evaluation. To get the most out of FSX, however, you will need more firepower than these specs, especially if you are going to be running it inside of a current OS X session. 4 GB of RAM is a good place to start. And you’ll need plenty of hard disk space. Similarly, running FSX in Parallels or Fusion on top of the OS X is a tall order. Try to pack as much RAM as possible into the Mac, preferably anywhere from 4GB to 8GB, or more. Get a large hard disk and plenty of processing power. Should you tweak the configuration files to make it run better? It sounds simple, but if something goes wrong you could botch up some software, or even worse fry your computer. It’s better to opt for more powerful hardware than freezing up the whole system. 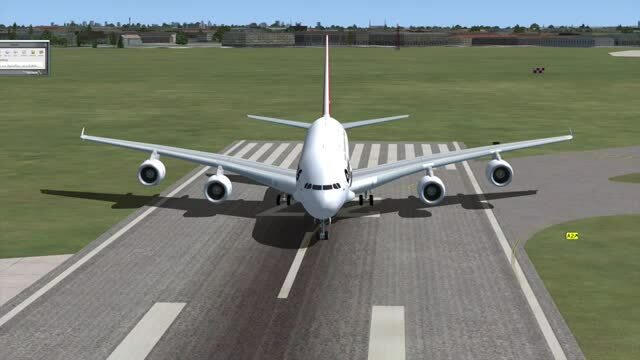 The video below was created running FSX on a Mac by using Parallels. It gives you an idea of what can be achieved. Whether you choose Boot Camp, Parallels or VMWare Fusion, the good news is you have plenty of options. You may want to start with Boot Camp and test how your system reacts. With good results, consider adding Parallels or Fusion to up the ante. Keep in mind that FSX is a graphics intensive game. It is leaps and bounds more immersive than Flight Simulator 2004. But impressive graphics come at a price. You should invest in as much hardware power as your budget allows. This advice is even more applicable if you plan on running other Windows programs at the same time as FSX. For example, concurrent screen capture programs can slow things down unless your system has the horsepower to keep everything running smoothly. Before you go ahead and buy a full copy of FSX why not download the demo and test it out? Also, we have a full review of the Steam Edition here. And don't forget, once you are flying and enjoying the default scenery/aircraft, be sure to expand your experience with the thousands of free add-ons (you don't even need to register) we have in the file library here. Crank up the power and you’ll be enjoying FSX on your Mac with no problems. Post your experiences and comments below, we'd love to hear them! Is there a way like to do an adjustment for resolution and then run the game faster? Either that or run something like VMware fusion, parallels workstation or the free virtual of from oracle. Scrub the last comment. I wrote it before the page completely downloaded. In my experience not one of the emulation programs has full access to the computer's video card's capabilities. That includes fusion. One thing you read on flight sim fora is how powerful a video card you need for this or that to work. Unless you use bootcamp you will be extremely disappointed. Hi. Can anyone. Help me out? I did the whole bootcamp process. However when its time to run the flight sim, its says the drivers may need to be updated. Iused a software. That finds these driver's. And it's also supposed to install the drivers aswell. But the never do install. It says error. Someone. Please. Help me. I am at my wits end. I spent a good bit on the this imac latest version just to push the fsx without breaking the bank. I really don't like the whole set up of the xplanes. Someone. Please. Help me. These are the tools I want to use to push me thru aviation school. Could some one tell me program in my control panel how to set it to for single engines and up to four engines. I have tried everything and I just can not get it programmed. I tried recently to install FS X Deluxe on Parallels Desktop 9 and it will not work. Any ideas? Hello, wonder if anyone has come across this issue - 2013 15" rMBP 2.3ghz with 8gb ram, Intel Iris Pro only. Installed Win8 on Bootcamp. FSX with SP1,2 (Acceleration) keeps freezing up before crashing. Win8 says system ran out of resources, which I find odd as this is the best specced machine I've had FSX on. All realism settings are set to medium to high - which shouldn't be a problem for this machine. Even with > 16 GB of RAM + 4GB of VRAM you can run out of resources with the FSX. It is an 32bit application and thus limits the (total) usable RAM to approx. 4 GB. If your settings within the fsx.cfg are to heavy (for instance TEXTURE_MAX_LOAD=4096 in combination with LOD_RADIUS greater than 4.500000) you will reach the limits very fast. The only way to reduce the probability of such a kind of crash is to reduce the settings. hello.is it possible for you to help me?i am really confused,i want to buy a md 101 mac pro with a4000 intel card and 5oo gb hard and acore i5 cpu,but i dont know is it possible to run a fsx on this configuration? I have ordered for the new Macbook released by Apple last month, I want to know if I can run FSX on it through boot camp couple with this USB-C stuff. Please someone advice. I am thinking of owning a iMac by end of this year and my only concern is how to switch the only game ever I play to iMax, the FSX, and this article solve the puzzles. Still I see in some of the screenshots, the screen is not utilized 100%, can we play them in 100% Full Screen mode? Running on boot camp just fine for me. Pushing 3 displays tents to make it crash so just running it on 2 at the moment. Few weird resolution issues from mission to mission. there doesn't seem to be any consistency with the video settings from within the game per each card/card output. Example... it tends to run about 960 scale on one screen, while the other screen will lock in at 1680 just fine. Have to compromise the screen correctly scaling to make it match the side stuck in 960. Other wise the sim has run great on my Mid 2012 Mac Pro... 2x 2.93 6-core with 12gb member. Running a slightly weak card (Radion HD 5770) but the sim doesn't require a killer gfx card. activating the 2nd card for the 3rd screen guarantees a crash for me. Could just be the way windows handles the cards under boot camp. I downloaded Parrells to my Mac computer. I downloaded the game onto parrells. I got a error code of 1406. Do you know what would cause this? I am trying to download the Microsoft simulator x onto my computer. Currently I'm running FSX Gold Edition (DVD set with FSX Acceleration) on my Macbook Air. Runs real nice! The detail is much better, there's no lag time and my other Windows games and programs run like a deer. Even if you switch over to a Mac mini, expect the same results. Best thing to happen to FS since Windows PCs.